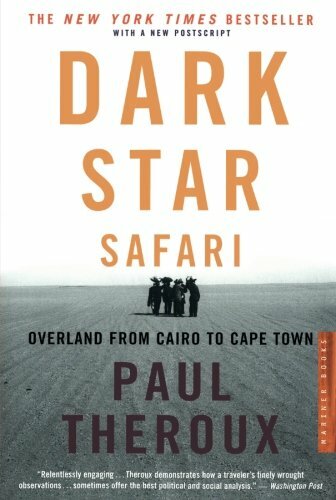 Dark Star Safari is a superb travelogue written in 2002 by one of the genre's finest writers, Paul Theroux. Eschewing game parks and sight seeing, and travelling the "hard way" through Africa by train, bus, truck and matatu, Theroux delivers an enthralling story of his journeys through Egypt, Sudan, Ethiopia, Kenya, Uganda, Tanzania, Malawi, Mozambique, Zimbabwe and South Africa. Travelling the hard way, ensures a journey down the road less travelled, especially when the road turns out to be the one that Osama bin Laden built whilst travelling in Sudan. The road less travelled (by non-locals), also enables him to make meaningful contact with all manner of different people and provides ample opportunity to solicit information, opinions and knowledge from all those that he meets. Customs officials, soldiers, drivers, businessmen, Rastafarians, traders, farmers and prostitutes all provide viewpoints on the past, present and future of each country he visits. Time and again, the message presented is "Wonderful people. Terrible Government. The African story". In portraying this message, Theroux expertly navigates the fine line between pessimism, cynicism, nostalgism and realism in describing an Africa that by displacing its "mzunga" and Indians, has in turn inexorably descended into decay and ruin. Theroux's homecoming to Africa, some 33 years after having spent a number of years serving in the Peace Corps and teaching in schools and universities, also ensures that he has access to people that most of us don't. Ministers (Prime and otherwise), Nobel laureates and former and current Ambassadors, are all called upon in order to add another flavour to this interesting story. For it is this myriad of people that forms the real backbone to Dark Star Safari, as counterpoint to other noteworthy situations such as being shot at by shiftas, canoeing the backwaters of Malawi, sharing $3 a night rooms with mosquitos and experiencing the entrancing whirling dervishes. Of course, it wouldn't be Theroux if he didn't have opportunity to find his own voice. This he does, most especially with regards the aid workers who meets and finds "in general, oafish, self-dramatizing pigs and often, complete bastards". This ability to express him without mincing of words, is particularly refreshing. Which, in turn, leads to an important theme contained within Dark Star Safari, and that of the role of charities and aid programs, which Theroux believes to have seemingly turned African problems into permanent conditions that are bigger and messier. Here he derides the likes of World Vision (Blurred Vision) and Save the Children (Shave the Children) and the lack of efficacy that 40 plus years of these efforts have served. Whilst this train (excuse the pun) of thought, might be uncomfortable or even unpopular, in light of the presented evidence, it is an argument which has considerable merit. Dark Star Safari presents the reader with no gimmicks and is not a journey of self or continental discovery, but rather a travelogue providing an insight to the lands and people through which he travels, which has been extraordinarly well written. Theroux successfully recreates the textures and emotions of the places he visits, making Dark Star Safari a genuine travel experience by immersing us back in to Africa.